Sony Alpha E-Mount 20mm f/2.8 Wide-Angle Pancake Lens. Sony Alpha E-Mount 20mm f/2.8 Wide-Angle Pancake Lens with In particular, image quality in peripheral areas has been dramatically improved compared to previous lenses. *Please notice: not include the retail box * Focal Length 34mm Type Standard Brand Jackar Model Snapshooter Compatible Brand Olympus Camera Type Mirrorless Maximum Aperture f/1.8 Bundled Items Lens Hood Focus Type Manual UPC Does not apply Brand Unbranded MPN Does Not Apply. Used as titled and pictured. Anything else required but not included in the photo you will need to prepare yourself. • Item is exactly as pictured so you know what you will receive. Ask for more photos if needed. Alpha 7 Alpha 7 II Alpha 7S Alpha 7S II Alpha 7R Alpha 7R II Alpha 9 alpha 3000 Alpha 5000. NEX 3NY NEX 5RL NEX 3NL NEX 5RY NEX-5RK NEX C3K NEX C3D NEX-C3A NEX 5NY NEX 5NK NEX-5ND as well as all. NEX-F3 NEX-5R NEX-7 K NEX-6 NEX-6Y NEX-VG10 NEX VG20 EH NEX VG30 NEX 5TY NEX VG900 E NEX FS100 NEX-FS700. Sony SELP1650 universal zoom. Modell SELP1650. 16-50 mm, F 3,5 - 5,6 OSS, E-mount. Produktlinie Sony Alpha. It is defective and is not included. Marke Sony. Optischer Zoom X3. Anschlussart Sony E-Mount. Trending at $262.91eBay determines this price through a machine learned model of the product's sale prices within the last 90 days. Superb image quality. GLASS: Front and rear glass and coatings are mint. I rate inside glass 9.9 /10 for cleanliness. AUTO-FOCUS: Fast and accurate. APERTURE: Works like new. ZOOM: Power zoom and manual zoom both work correctly. OSS works correctly. EXTERIOR: Light wear. Near mint. Albinar 80-200mm f3.9 Lens Pentax K- Mount + Sony E-Mount Mirrorless Adapter. HELIOS 44-2 (2.8/58mm)Russian SLR Lens. - Lens mount: S ony NEX E-Mount / M42. - Filter mount: M49x0.75. - Scale of diaphragms: from 2 to 16. - Excellent condition. Glass is clean and clear, no scratches, no dust inside, no fungus. The 8mm lens focuses as close as 12" (30.48 cm) from the lens. Ultra wide-angle 8mm fisheye lens with exaggerated perspective for dramatic effects. Maximum Aperture: F3.5. Aperture Range: F3.5 to F22. Maximum Aperture: F3.5. Focal Length: 24mm. Lens Hood: n/a. Description: New Kaxinda 14mm f3.5 APS-C manual foucs lens for Sony NEX E mount camera Be equipped with a multitude of technology to further ensure unmatched image quality. 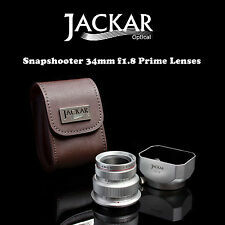 Smooth manual focusing ring ,ensures quiet, Rear focusing system ,minimize fluctuation of aberration caused by focusing. Accurate focusing,Super Multi-Layer Coating , reduce flare and ghosting, With non-removable hood，block out extraneous light HD, multi-coated optic fiter , sharper images Exquisite workmanship, all-metal manufacturing Cost-effective , good Shooting ，better than the same brand lenses . Lens type: Manual focusing fisheye lens. Focal range: 8mm. Sony NEX-3 NEX-5 NEX-C3 NEX-5N NEX-7 NEX-F3 NEX-5R NEX-6 NEX-3N NEX-5T A3000 A7 A7R A5000 A6000 A3500 A7S A5100 A7 II A7R II A7S II A6300 A6500. Sony Alpha 7, 7R, 7S, NEX-VG10, VG20 etc. INDUSTAR-61 L/D 2.8/55 Russian Soviet USSR Lens M39 with Adapter for Sony α NEX. How to Use manual focus (MF) lenses with the use of the adapter with Sony NEX. Compact and lightweight standard zoom lens with high cost performance compatible with 35 mm full size. While covering frequently used frequencies from 28 mm to 70 mm, the latest optical design realizes a small body with less change in overall length during zooming. Focal length 1300mm! NEX-VG10, NEX-VG20 EH, NEX VG30, NEX 5TY, NEX-VG900 E. NEX-FS100, NEX-FS700, NEX-EA50, NEX - 5T, NEX - 6L, NEX-5TL. all digital Sony NEX eg. NEX-C3A, NEX 5NY, NEX-5NK,NEX-5ND, Alpha 7, 3000 alpha, Alpha 5000. High quality 25x - 75x zoom adjust eyepiece. 25-75X Zoom Spotting Scope. One Zoom spotting Scope with 25-75x eyepiece. 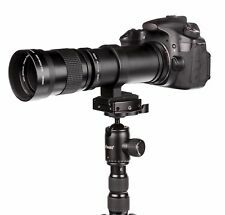 Plus zoom adjustable mount adapter & one DSLR mount adapter. Optional step ring available for : 25mm,27mm,28mm,30mm,30.5mm,34mm,43mm, 46mm,49mm,52mm,58mm etc. The built-in optical SteadyShot image stabilization of the lens ensures pin-sharp, blur-free photos and videos in hand-held recordings. Instead of a standard polygonal aperture, this lens features a 7-blade circular aperture for natural, soft bokeh. Sony Alpha SEL1855 E-mount 18-55mm F3.5-5.6 OSS Lens (Black). E 18-55mm F3.5-5.6 OSS Standard Zoom Lens. 18-55mm lens, front lens cap and rear lens cap. Maximum Aperture: F1.7. Manual Focus, Maximum Aperture: F/1.7. Focal Length: 35mm. 1 Lens Front Cap. 1 Lens Rear Cap. Compatible Mountings: SONY E-Mount. Multi-coated technique for exceptional image quality. Sony Alpha E-Mount 20mm f/2.8 Wide-Angle Pancake Lens with 32GB Card NP-FW50 Battery Case 3 Filters Kit. 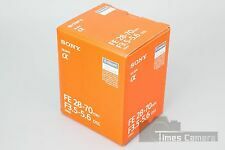 Sony Alpha E-Mount 20mm f/2.8 Wide-Angle Pancake Lens. Sony Alpha E-Mount 20mm f/2.8 Wide-Angle Pancake Lens with.